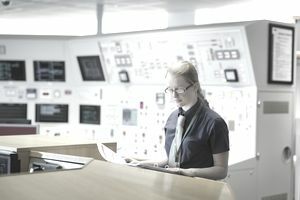 A nuclear operator controls the flow of electricity a nuclear power plant generates and is also known as a reactor operator (RO), nuclear power reactor operator, or control room operator. He or she adjusts and maintains the plant's equipment, implements procedures that regulate the start-up or shut-down of the facility, and responds to abnormalities and takes appropriate action. A senior reactor operator (SRO) supervises reactor operators. Nuclear operators earn a median annual salary of $93,370 (2017). 7,000 people are employed in this occupation (2016). Most nuclear operators work for public utilities. A small number work for governments. The U.S. Bureau of Labor Statistics predicts employment in this field will decline from 2016 to 2026. "As directed, starts, stops, adjusts, tests, and operates pumps, valves, switchgear, controls, and other components of systems"
"Performs routine tests, incidental maintenance, electrical switching, and other activities necessary to ensure continuity of power generation"
"Places in operation, operates, and removes from operation equipment using approved station procedures"
"Collects, sorts, segregates and packages radiological waste"
If you want to become a nuclear operator, you will need only a high school diploma, but a college or vocational school degree can make you a more competitive job candidate. You may also receive training by enlisting in the U.S. Armed Forces, specifically the Navy. Many employers use the Edison Electric Institute Power Operation Selection System (POSS) to help them select employees. It is a test battery that assesses whether an applicant has the aptitude to work in this occupation. You will need a license from the United States Nuclear Regulatory Commission (NRC) to work independently as a nuclear power reactor operator. If you change jobs, you will have to get a new license. A power plant can employ you as an equipment or auxiliary operator under the supervision of more experienced operators until you become licensed. You will undergo extensive on-the-job and technical training to prepare you for the NRC Licensing Exam. You will have to pass a physical exam and drug test as well. According to the NRC, there are two types of licenses: Reactor Operator (RO) and Senior Reactor Operator (SRO). To get an RO license, you need at least three years of experience working in a power plant and at least six months working in your current facility. With at least 18 months of experience as a non-licensed operator, a plant staff engineer, or plant manager, you can apply for an SRO license. You don't need a college degree to apply for an SRO license if you have worked for at least one year as a licensed RO (United States Nuclear Regulatory Commission. Reactor Operators: What It Takes to Do This Very Important Job). To retain your license, you will have to pass a plant-operating exam every year and a physical exam every two years. What Soft Skills Will Help You Succeed in This Career? Active Listening: You must be able to understand information others convey to you. Concentration: The ability to focus on tasks is imperative. Problem Solving: You must have the ability to identify problems. Critical Thinking: After you identify a problem, this skill will allow you to evaluate possible solutions and choose the best one. Reading Comprehension: You must be able to understand written documentation. Monitoring: You need the ability to assess your own and others' performance, as well as monitor equipment. You will need to go through very rigorous training provided by the facility that employs you. Since nuclear plants never close, operators work around the clock on 8 to 12-hour rotating shifts, which means they don't work the same hours all the time. The upside of this type of scheduling is that it prevents workers from always being on duty only nights or only days. The downside is that it keeps them from getting used to a regular schedule. "Qualified candidates should be friendly and mature, able to multi-task, and work well with others"
"Must be familiar with, and comply with, all relevant health and safety requirements"
"Ability to obtain and maintain unescorted access to work at a nuclear power plant"
Sources: Bureau of Labor Statistics, U.S. Department of Labor, Occupational Outlook Handbook; Employment and Training Administration, U.S. Department of Labor, O*NET Online (visited June 15, 2018).